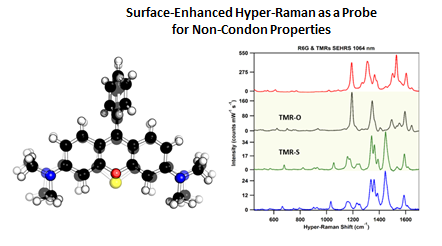 Surface-enhanced Raman spectroscopy (SERS) has been employed over a wide range of applications due to immense signal enhancements (~106 – 108) observed upon incorporation of metal nanoparticles compared to Raman spectroscopy. For analytical applications, it is imperative that the analyte of interest be close (ideally < 5 nm) to the nanoparticle surface to take advantage of signal enhancement effects. Historically, thiol-based ligands have almost exclusively been utilized to bind analytes for SERS due to their high affinity for noble metals, namely gold. Thiols unfortunately exhibit distinct disadvantages such as chemical instability and complex synthetic procedures that often involve adding protecting groups. N-heterocyclic carbenes (NHCs) have recently emerged as a viable alternative to thiol ligands, demonstrating superior chemical stability on Au surfaces. Subsequently, our group and collaborators investigated the deposition of CO2-adducted carbenes on nanoscale roughened gold substrates, further generating the first NHC SERS spectra. This initial publication has provided a strong platform for our group to continue exploring these robust ligands through theoretical investigations on NHC-Au surface orientations coupled with experimental data and post-synthetic modifications monitored by SERS. Two-photon techniques are advantageous to their one-photon counterparts in that photobleaching is reduced, observed radiation is easily discernible from incident, and penetration depth is increased. These higher order processes, however, produce a much weaker signal, limiting their utility. Through rational design of two-photon active molecular tags, the nonlinear response can be increased and uniquely tuned. Surface-enhanced hyper-Raman scattering (SEHRS) and theoretical calculations can be used a tool to observe vibrations coupled to the excited state profile of systematically varied rhodamine-derivative dyes. Spectral changes and non-Condon effects observed in the rhodamines series can be understood by tracking the vibrational normal modes and the vibrationally induced changes to the highest occupied molecular orbitals. With a system in place to explore the relationship between structural geometry and nonlinear properties, various rhodamine-derivatives can be characterized as a means to optimally design a series of designer two-photon bright compounds. The molecular orientation of surface adsorbates is of fundamental importance to many technologies utilizing plasmonic nanostructures. For example, the local geometry of the adsorbate is crucial to the design of next-generation functionalized nanostructures as geometry dictates the strength of the spectroscopic response, the ability to recognize analytes, and the way energy flows between the particle and its environment. Despite the importance of the problem, it is particularly challenging to probe molecular orientation on nanoparticle suspensions in aqueous solution. Traditional techniques such as sum-frequency generation vibrational spectroscopy (SFG-VS), high-resolution electron-energy loss spectroscopy (HREELS), and surface-infrared methods can provide insights into the orientation of molecules at the metal-air interface, but such methods are very difficult to realize in complex environments such as colloidal nanoparticle suspensions and particles imbedded in a matrix, i.e. serum or tissue. We utilize the multiphoton nature of SEHRS to measure molecular orientation at surfaces, especially those in complex environment. It is usually assumed that extreme weakness of the hyper-Raman effect precludes it from being the basis of a sensitive analytical method. As demonstrated previously, however, the large enhancement factors provided by adsorption to plasmonic particles can increase the sensitivity to the level of single molecules. Furthermore, the maximum enhancement factors for nonlinear scattering are known to be larger than those observed for methods such as SERS which suggests exciting potential for SEHRS-based sensing schemes. We have previously demonstrated that SEHRS is viable as a method for trace analysis and propose SEHRS-based methods that deliver superior sensitivity by exploiting the unique spectral signatures and chemical effects available in nonlinear spectroscopy. Olson, J. E.; Tripp, A.; Linder, M. K.; Hu, Z.; Detty, M. R.; Jensen, L.; Camden, J. P., Non-Condon Effects in the Resonance Hyper-Raman Scattering of Chalcogen-Substituted Rhodamine Derivatives. J. Phys. Chem. C., Just Accepted. Nanoparticles that are able to harness and concentrate light into intense surface bound electric fields, localized surface plasmons (LSPs), have been employed in a variety of applications, ranging from solar light harvesting to small molecule sensing. Describing the energetics of these systems, however, continues to be a challenge for the advancement of the field, primarily due to resolution limitations at the nanoscale. In recent years, however, electron energy loss spectroscopy (EELS) in combination with a scanning transmission electron microscope (STEM) has emerged as a powerful tool capable of resolving plasmons both energetically (<0.1eV) and spatially (~1nm), providing a unique lens for probing plasmonic materials. Using STEM/EELS in combination with optical spectroscopic methods, we have been elucidating plasmonic energy transfer for processes such as particle to substrate or plasmonic catalysis, and continue to design simple plasmonic systems in order to build base our base of knowledge. (3) The detection of trace heavy metals, specifically uranium, in water samples using field-deployable SERS methods in addition to hyper-Raman. The U-Watch Citizen Science project is a collaboration between the Camden Research Group and the Center for STEM Education at the University of Notre Dame. The overall goal of the project is to engage K-12 teachers and students in authentic science focused on the detection of uranium in water. U-Watch seeks to accomplish this goal by engaging students in classrooms across the country in collecting water samples from a wide range of sources, and then analyzing those samples by a standard method (ICP-OES). Gu, X; Trujillo, M. J.; Olson, J. E.; Camden, J. P., SERS Sensors: Recent Developments and a Generalized Classification Scheme Based on the Signal Origin. Annual Review of Analytical Chemistry (2018), 11, 13.1-13.23. DOI:10.1146/annurev-anchem-061417-125724.